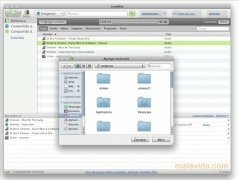 The Gnutella network is one of the most used nowadays, and one of the most popular clients to be able to share files over it, is without any doubt, LimeWire. It's a very efficient P2P client, that through a very simple interface, will allow us to connect to a server, performing searches (allowing us to filter the results depending on what kind of documents that we want to download), obtain the contents that we want and manage a list of friends with which we'll be able to share files directly. Other functions worth highlighting of this application are the system to create playlists and play the files, and the library to be able to manage the downloaded files (with which it will be very easy to organize all the songs or the films that can be found within it). The interface, as well as having a very simple appearance, has shortcuts to the program's most important functions, making it much easier to use. If you still haven't found a quick and stable P2P client for Mac, look no further and download LimeWire right now.